Mauricio Santoro is a man of many hats. He's a political scientist by trade, and is working as an advisor at Amnesty International in Rio. He's also a university professor and a columnist, and is active on social media. And in this age of the proliferation of experts, he's someone who really knows what he's talking about, making him a great asset for journalists. I've known Mauricio for years through social media, and in April I had the chance to finally meet him in person and chat about his work. Here are edited excerpts from our conversation. In Brazil, there are several human rights crises a week, says Santoro. "The Amnesty office was created in part to work on Brazilian issues, but also to bring Amnesty's global issues to a Brazilian audience," he explained. "For example, we did a campaign on homophobia in Russia, which went really well because people identified with it. It's the same thing whenever we talk about the United States, because Brazilians love to criticize the U.S.," he laughs. "The Middle East is hard; it's very complicated and tends to divide our base." Santoro focuses on four main areas: foreign policy and human rights, education and human rights, indigenous peoples, and issues related to the dictatorship. But he notes that things can come up unexpectedly with such frequent crises. What's the Most Important Human Rights Issue in Brazil? "If I had to choose one, it'd be homicides," says Santoro, "because Brazil is the country that has the largest number of murders in the world." "Proportionally, it's not the most violent country, though it is in the top 10. It's the most violent in terms of absolute numbers of homicides. Brazil alone has more murders each year than the United States an the European Union combined. More than China, more than India, and these are countries with much bigger populations than Brazil. We're talking about something around 50,000 homicides a year. There are countries at war that don't reach that annual number." Murder, perhaps, is the most serious violation of human rights, says Santoro, "because there's no turning back." The most you can do is to try to compensate by ensuring justice for the family and to provide support to those close to the victim, he adds. "With 50,000 murders a year, that means around 130 murders a day. It's such a big number that it ends up creating a feeling of insensitivity and apathy." There are two ways Amnesty is dealing with the issue. "The first is what we call the 'symbolic deaths' in order to mobilize people. Nobody goes out to protest because of a statistic. People protest because they found out about the story of a life. The story of Amarildo last year was the most important case of human rights in Brazil because it was an individual story that illuminated this greater trend of human rights violations, and it brought together the issues of death, disappearance, torture, and the pacification debate." But there's a challenge to this approach. "The classic homicide victim in Brazil is a young, black man, who lives in a favela or a neighborhood on the city's outskirts. Our director says there's an epidemic of indifference in Brazil with relation to the death of these young people. It's rare to find a case like that of Douglas (a dancer who was killed in Rio in April), that one of these murdered people has a first name, a last name, a face." The second way is a new study. It aims to compile information about the murders of young black men in Brazil, because "the data on this is still shaky," Santoro explains. "We don't have official documentation about how they died, whether in a shoot-out with organized crime or in a fight with a neighbor, or if they were killed by police. So this research is to fill the gap. We're also going to launch a sensitization campaign to convince people that these young people had a life story, they had dreams." Santoro gives an example of last year's fire in a club in Santa Maria, in Rio Grande do Sul. "It was very interesting the way that tragedy was covered in the media and played out in public opinion. I remember seeing several newspaper and magazine covers showing the faces of the people who died. And there were several of their stories. 'This girl wanted to be a doctor. This guy was trying to join the Air Force.' It wasn't just a statistic: 200 or so people died there. There was a life story. And that's the correct way to deal with this type of tragedy. The problem is that we're talking about an audience that's largely middle class, and the people who are dying in Brazil are largely young and poor." There's a flipside to the coverage of the Rio Grande do Sul tragedy. Santoro gives the example of Salvador, the city that has the largest number of homicides in Brazil. "The New York Times did a very good special on Salvador, talking about violence and urban decay. I never saw that in a big Brazilian publication," observed Santoro. "It's partially because the Brazilian media does a lot of coverage of Rio, São Paulo, and Brasília, and does little about the North and Northeast. During one of Salvador's police strikes, over 80 people died in the metropolitan area. I don't know the names of these people. And it's possible that more people died in Salvador in those three days than in Syria during its civil war. The media didn't talk about these people's stories." Because transportation affects the right to come and go and the right to the city, it's considered a human right, Santoro says. "Last year, an official from the Inter-American Commission on Human Rights visited and met with mothers who had lost children to violence in Rio. She asked them what they considered a priority human right, and which rights they thought were being violated. And their answer surprised me. They said it was the 'right to time.' And they explained that they have to work and care for their families, but waste a lot of time in traffic during their commute. They felt bad for leaving their children with others who may not have been the best influence." Transportation affects many in Rio, Santoro explains, and it impacts citizens' participation in their communities. "You imagine someone, for example, who lives in Rio's West Zone, which is now the most populous area of the city, where it easily takes three hours to get to and from work in very poor conditions. Buses, trains, overcrowded and dangerous vans. These things accumulate and make Cariocas' day-to-day very hard and there's a loss in quality of life. It affects families and community life. Someone who spends three or four hours a day on public transportation every day won't want to participate in a community board meeting, or would want to sit and debate what's happening in their neighborhood. It's also very common for transportation to not only be very bad, but very expensive, so that people don't circulate much in the city of Rio and instead stay confined close to their neighborhoods. In a city like Rio that's unequal in terms of access to culture, this means that generally these people won't be able to get to see much of the city's cultural side, which is largely concentrated in downtown and the South Zone." There's also the issue of prejudice. Back in April, an actress was photographed on a public bus. "It was absolutely a normal thing, but it became a scandal," Santoro notes. But because the middle class uses public transportation, there's more pressure to improve the quality of service, he adds. This differs from the issue of sanitation, for example. "For the government, sanitation is an investment that has low electoral returns, and it takes a long time to build sanitation infrastructure. So it's probable that a government that starts one of these projects won't finish in a single term, and the person that finishes the projects is the one who will get the visibility of victory, likely the original person's successor. So this acts as a strong mechanism to not incentivize this type of activism. It's different from, say, constructing a school and putting up a plaque." Favela Protests: A New Phenomenon? I asked whether favela protests represent a change, and he said yes--with a caveat. "The novelty is not that there's protests in the favelas. This is something that dates back to the 1970s, if not before. What I think is new about these favela movements is that in general it's something very local in each community, and now they're managing to create alliances with middle class movements and other activist groups. So for example, during last year's protests, there were protesters who left en masse from Rocinha and Vidigal and crossed Leblon, Rio's upper-middle class neighborhood, and went to demonstrate in front of the governor's house. That, I'd never seen before. Maybe it happened at some point, but I'd never seen anything like it. Also, it was interesting because they knew they had to take certain precautions, different ones from that of the middle class activists. None of them had their faces covered, no masks or bandannas. Because the kids who come down from Vidigal or Rocinha to protest know they have to be very, very careful not to give any excuse to the police to intervene." I spoke to Santoro a few months before the games started, and he said that ahead of the games, the Cup had had very negative consequences. "There were a certain number of favela removals associated with the World Cup, and perhaps the most symbolic one was the Metro Favela close to Maracanã where a good portion of homes were removed to build a parking lot. This is very powerful symbolically, removing people from a favela right in front of the stadium." Another question is the future of the stadiums. "In places like Brasília and Manaus, who is going to use them? Is there really no better destination for those funds? I don't mean to say that the money used for the World Cup could solve Brazil's social problems. Not even close. These investments represent a small fraction of the Brazilian federal government's budget. But it's clear that when people have access to poor-quality public schools, public health, and public transport, these stadiums stand in contrast, and it's like rubbing salt in the wound." With a rise in the cost of living, it's not just stadiums that are becoming gentrified. "It's happening in various Brazilian cities, but it's especially acute in Rio due to geographic and policies. Rio is a city that historically has been squeezed between the ocean and the mountains. There's not a lot of space, and Rio apartments are generally small in comparison to other cities. In the 1940s and 50s, the city began to grow west, with neighborhoods like Barra da Tijuca, Bangu, Realengo, Vargem Grande, the same parts of the city that are growing today and the only place left for the city to grow. And because of limited heights for buildings, you're not going to see a South Zone with highrises like in São Paulo." As a result of limited space, Rio has become an expensive place to live, Santoro says. "There's also things like the mega-events and the pre-salt discovery. And then there's the public security policy to construct pacification units in favelas. This resulted in security improvements in several middle-class neighborhoods that used to have problems like stray bullets and shoot-outs. This raised prices, too, in the neighborhoods and in the favelas themselves. Vidigal is one of the best examples; it's becoming a bohemian neighborhood, with lots of artists and foreigners moving there." Follow Santoro on Twitter, Facebook, and the Brasil Post. Photo: Mauricio Santoro at Rio's Amnesty International offices. Image by Eliseu Cavalcante. Batalha do Passinho, a documentary about Rio's passinho dance craze and the city's passinho dance competition, has come to New York. The documentary debuted on July 22 at Lincoln Center Out of Doors, and was followed by a passinho dance party featuring dancers from the film. Even though they flew in this morning, the dancers still managed to wow the crowd and even teach their moves to curious partygoers. The movie will be shown again on August 2 at the Film Society at Lincoln Center, and the passinho dancers will perform at Lincoln Center Out of Doors on July 24 and July 26. I've been following the passinho craze for awhile, and interviewed the documentary's director last year. The movie is an excellent way to learn about the dance and how it's become a cultural phenomenon in Rio. But for international audiences, here's some extra context that may help you understand more about the dance's significance and why it's a big deal that it's being featured in New York. Funk, the music that passinho is set to, has been around for awhile but has had a complicated history. Akin to rap, it's had a stigma signifying poverty and violence attached to it, despite its popularity. Even though wealthy youth sometimes attend funk parties in favelas, a person who likes funk, a funkeiro, is associated with a person who lives in a favela. For this reason, it is a huge deal that funk and passinho are being featured at Lincoln Center, the stage for some of the world's greatest music and dance companies. The film doesn't delve too deeply into the dancers' lives, but the truth is that it's refreshing to see a documentary focused on Rio's favelas that's not devoted to poverty and violence. The fact is, though, that passinho represents a potential opportunity for young people who get involved in the scene, and an alternative to another dominant force in their communities: drug trafficking. One of the dancers says in the film that his "dream is to be recognized," which to me sounded like not only recognizing his dancing but also recognition for being more than just a favelado, a kid from a favela. Another element that I found interesting about the passinho is how it's a reflection of other elements of Brazilian culture: a fusion of styles incorporating foreign and Brazilian influences. In this case, passinho melds hip hop, pop and lock, breakdancing, samba, and frevo. It's also reflective of Brazilians' abilities of creativity and spontaneity, given that the dance is frequently improvised. The next important thing to know is that passinho's transition from becoming popular in the favelas and being picked up by major media was a huge step. Xuxa, one of the country's most famous entertainers, featured several of the dancers on her show, as shown in the film; and Globo, the country's biggest media conglomerate and TV station, has showcased the dance on numerous shows. One of them is Esquenta, a show that has brought favela culture and issues to mainstream audiences. In some of these cases, dancers speak openly about where they're from. Just a few years ago, "the idea of asking someone what favela they were from, on national television, was unthinkable," wrote Rio Real blog's Julia Michaels last year. Passinho also reveals the shifts taking place in Brazil, notably conspicuous consumption by the new middle class and the power of digital inclusion. The film highlights the fashion and aesthetic styles associated with passinho, which recalls funk ostentatação, or ostentatious funk, where performers sing about consumption and fans seek expensive name brands to imitate artists. Plus, this type of consumption is part of being a member of Brazil's new middle class. And finally, passinho owes its quick spread to social networks like Orkut and Facebook and videos on Youtube. With more young people having access to the internet and smartphones, passinho not only spread throughout Rio, but also in Brazil. Plus, internet exposure from artists like Ricky Martin featuring passinho dancers have helped bring the dance worldwide. The World Cup raised important questions that have yet to be answered: was it worth it? Will it pay off financially? What will the legacy be? Another question I'm interested in: does it mark a shift in how Brazilians see themselves compared to the rest of the world? Is it the beginning of the end of the so-called mutt complex? When Brazil was awarded the tournament in 2007, leaders envisioned it as a coming-out party, a chance to show the world how much had changed and how the country had become a global player. In spite of the international scrutiny and criticism leading up to the games, the truth is that Brazil really had come a long way since the last time it hosted the World Cup in 1950. Dictatorships gave way to democracy; hyperinflation ended and gave way to growth. Stability replaced uncertainty, and a drop in poverty and the growth of the new middle class transformed the country. The Brazil of even 1994 and the Brazil of 2014 were different places. And though the government didn't deliver on all of its World Cup development promises, enough projects came together in time to hold a spectacular event. "The biggest price [to pay], until now, is the discouragement, the general unease, the sensation that we are a proven wretched society, second class, that doesn't manage to plan, that doesn't manage to follow through, that's incapable of control, that's impotent to put a stop to things - [it's] not a matter of holding the Cup, but the disasters exposed via satellite on occasions like this one. We're afraid of being embarrassed in front of the world. We're tormented about what they're going to say about us abroad, about our airports, our highways, our hospitals." "The Cup doesn't have the power to transform Brazil...and that's where the problem lies: at some point, we believed that we could pretend to be something that we're not. Nations are like families. We don't want our anger, our bitterness, our discord, and our misery to be exposed. It's always more comfortable to sweep everything under the carpet. Maybe this could have been done if the world hadn't changed since 1950, and if everything boiled down to the national passion, to football. Evidently, that's not the case." When the games went well for the most part, there was a sense of relief, but there was still evidence of the anxiety about foreigners' perceptions. I spotted pieces like this one in the Brazilian press: "Congratulations, Brazil, says Scottish journalist who took 29 flights without delays." Pollster Datafolha did a survey about what tourists thought about the games, asking about Brazil's performance as a host, public security, transportation, stadiums, protests, hospitality, and other issues. The results, unsurprisingly, were largely positive: 83 percent approved of the organization of the tournament, and 69 percent said they'd like to live in Brazil. It's the kind of thing that makes you picture Brazilians thinking: "They love us, they really love us!" Still, the idea that there was a greater focus on issues other than soccer before and after the Cup means things could be changing. With another mega-event coming up in two years, time will tell to see if and how Brazilians see themselves on the international stage. Image: Fans at the 2014 World Cup. Paulisson Miura. In a stadium packed with Brazilians in a World Cup hosted by a Brazil eager to show itself off to the world, the country's national team delivers a shocking defeat, leaving fans stunned and searing a tragic scar on the nation's history. Somehow, history has repeated itself. After the 1950 Maracanazo, when Brazil lost to Uruguay during its first time hosting the tournament, it didn't seem like another soccer defeat of that magnitude could be possible. But today, it became a reality as Brazil lost 7-1 to Germany in its worst loss in 94 years. A new national tragedy was born, the Mineirazo, in a defeat made worse by the magnitude of goals and the team's poor performance. It was a culmination of a run that first began with a Brazilian player scoring on his own goal and a nail-biting Round of 16 game during which Brazil only eked out a win in penalties. 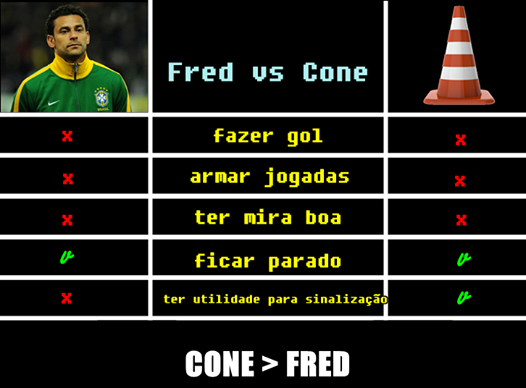 Throughout the tournament, Brazilians complained about the quality of some players, particularly striker Fred, who was often compared to a cone. Neymar's injury and losing one of the top players for today's game due to a yellow card hurt, but the team did so poorly that analysts called them amateurs and fans called them an embarrassment. The seleção has to play again on Saturday for third place, but it will not play a single game in Maracanã during this World Cup. After the game, Brazilian fans were devastated, in shock by the sheer magnitude of the defeat, which some say is worse than in 1950. Even statisticians were surprised; Five Thirty Eight's Nate Silver called it "the most shocking result in World Cup history." It's hard to explain the impact of this kind of loss in Brazil. Europeans can relate, perhaps, but there's really no equivalent in the United States. It goes beyond soccer. Some fans take the loss personally, or feel some sense of responsibility. When Brazil lost in 1950, it left a mark on the Brazilian consciousness and inspired the idea of the "mutt complex," in which Brazilians express self-doubt in the country and a type of inferiority complex in comparison to the rest of the world. After the game, Mauricio Santoro, a Brazilian human rights advocate and an overall Brazil expert, said that the mutt complex is officially reinstated. A Brazilian on Twitter remarked that attempting any analysis of the game is akin to trying an autopsy on someone who fell from a 30-story building, so I thought I'd look at what the game won't mean. 6. It doesn't mean massive protests will start up again. There were some small protests today and ones throughout the past month against the World Cup, but nothing on the scale of the June 2013 demonstrations. Those massive, popular protests were linked to a complex host of social issues and not Brazil's soccer performance. 5. It doesn't mean Brazilians will lose complete interest in the World Cup. Besides having to play what promises to be a painful match for third place on Saturday, the tournament hosts are, after all, lovers of the beautiful game. Plus, they will be avidly rooting against Argentina. The only thing that could make this loss worse is if Argentina wins in Brazil. 4. It doesn't mean Brazilians will be unable to shift their focus to other issues after the Cup. Some of the comments I saw were for Brazilians to instead put their energy into moving the country ahead and to think about the issues raised during last year's protests, like health and education. "We should have built hospitals instead," fans joked on Twitter after the game. The faster this shift in focus happens, the better, to show how the country is changing its priorities. 3. It shouldn't overshadow Brazil's success as the host. The tournament has largely gone smoothly, in spire of predictions to the contrary. With the exception with some outbursts of violence in a few cities following the loss, overall the games have been a success. 1. It's unlikely it will have an impact on the presidential election. Despite a lot of chatter and rumors that the World Cup could make or break Dilma's chances at reelection, past elections have shown that there's no definitive correlation between Brazil's World Cup performance and presidential votes. A recent UBS study confirmed there's no relationship between the two, and could only have a real impact if the games took place up to two weeks before the election. Image: The site of the country's new big sporting tragedy, the Mineirão in Belo Horizonte. Photo: Evaraldo Vilela. Updated July 9 with short doc from Folha de SP.